Cofounder of the Cobra group. Appel settled in Paris in 1950 with Corneille. From 1957 he lived part of the year in New York. His first visit to Paris dates from 1947, and was made in the company of Corneille, whom he had met at the School of Fine Arts in Amsterdam (1940–1943) and with whom he exhibited in 1947 in his home town. The two artists lived in an insalubrious studio near the leather market. Colette Allendy showed Appel’s work in Paris for the first time in 1949, in addition to works by Constant and Corneille who, in 1950, also showed in the group exhibition Tendances with Atlan, Doucet, Corneille, Constant and Tajiri, at the first Cobra exhibition in Paris at La Librairie, number 73 boulevard Saint-Michel (Cinq Peintres de Cobra, with a preface by Michel Ragon), and then at the Galerie Pierre in 1951. The public was shocked to discover this brutal and vehement style of painting, with its violent colours and excessive textures and gestures. While geometrical abstraction had conquered the art scene and figurative painting was successful in Right Bank galleries, this expressionist exuberance employing a bestiary fed by folk art, which stopped short of neither caricature nor naive characters, seemed to the spectator to be intentionally hostile. Michel Tapié was not mistaken. In his manifesto book on informal painting, Un art autre (1952), he included Appel, with reproductions of two paintings: Femme oiseau and Chanteuse des rues. Appel was next to Dubuffet, Mathieu, Pollock, Fautrier, de Kooning and Ubac, all of whom were embarked on an artistic and expressive adventure that Tapié called ‘Signifiance de l’Informelle’. Appel participated in Michel Tapié’s exhibition Peintures non abstraites in 1952 at the Studio Facchetti. When Appel began a painting, only the texture and colour were of importance to him. He then made an image appear from the matter: heads, always identifiable, or more abstract landscapes. This is what the artist said about his approach: ”The first stage, red and yellow, is always beautiful… This is when I try to control the validity that a cruel dialectic opens up. Doubt is born from antagonism. A painting is not the result of systematic research but of an experience full of anxiety.” It is necessary for the painter to find a balance between instinct (or urges) and understanding, hence the rapid execution of the work. From 1954 Appel applied paint straight from the tube. An evolutionary trend makes it possible to date the works produced before 1955: first drawings in 1948 incorporating abstract graphics and graffiti; coloured figures in 1950, Têtes in full impasto and Portraits imaginaires of 1955, after which date Appel exercises a combination of perfect control and total freedom. The drawing is identified with the colour he uses to do the body. Nus blancs et noirs of 1957 to 1958 followed by Têtes volantes and Fantômes. In 1954 Appel had a solo exhibition at the Studio Facchetti, with a preface by Michel Tapié. The same year he showed at the Martha Jackson Gallery in New York. In 1960 he won the Guggenheim Prize. In 1952 and 1953 he took part in the Salon de Mai, and then each year from 1957 to 1965. From 1964 onwards he lived and worked at the Château de Molesmes near Auxerre. From 1977 onwards he divided his time between Monaco and New York. 1982–1983 Appel-Alechinsky. Fondation Maeght, Saint-Paul-de-Vence. Catalogue. 1988 Appel. Retrospective at the Paris Art Centre. Appel’s works are in many museum collections. Christian Dotremont: La Jeune École de Paris, by Jean-Clarence Lambert. Le Musée de Poche, Paris, 1958. Écrits sur Karel Appel, Galilée, Paris, 1983. 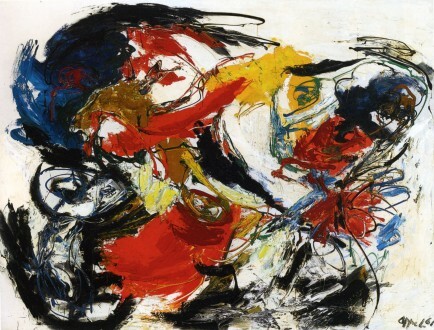 Karel Appel. Propos en liberté. Interviews with F. de Towarnicki and André Verdet. Galilée, Paris, 1985. Karel Appel, Quarante ans de peinture, sculpture et dessin, Galilée. Paris, 1987. Michel Ragon: Appel. Peintures 1937–1957, Galilée, Paris, 1988. Jean-Clarence Lambert, Marshall Mc Luhan: Karel Appel, œuvres sur papier, Cercle d’Art 1988. Michel Ragon: Appel, de Cobra à un art autre, Galilée, Paris, 1988.